The tiny dot on the white ribbon is Hunter. Making our way up around 9,000′ towards Coyote Ridge. The photo doesn’t do the views justice! The juices were flowing… I happened to be going down to L.A. for work on (SouthLAnd) a few days later, so I scouted the area as best I could since I was driving through Bishop anyway. 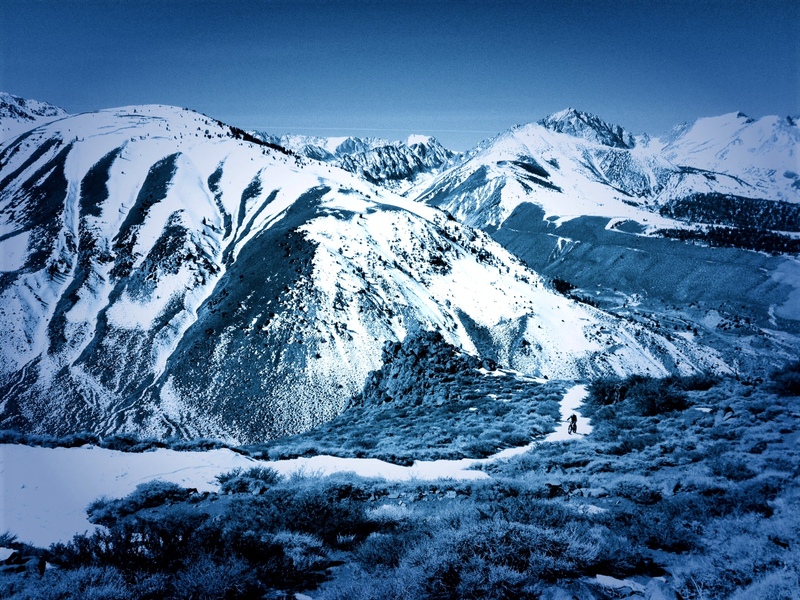 So I drove up the 168 to South Lake, and stopped at Bishop Creek Lodge to check out trailhead conditions. There didn’t appear to be “that much” snow up there. From what I could see, it looked fairly clear to ride. Of course, I could not see up and over Coyote Ridge, but I figured that if it was anything like what I could see, than Coyote Flats was probably rideable for the most part, even though there would definitely be some hike-a-bike sections. In hindsight, this was probably all just wishful thinking, since I really wanted to get the fatty up there and see what it was all about. In the back of my mind, I knew I was gonna do it regardless of what the “scout” told me. Funny how the brain works, eh? 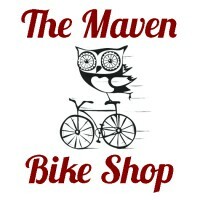 Hit up my friend Hunter, who’s also a fatty/adventure/bikepacking enthusiast in town. You wanna go try the Coyote Traverse on Thursday morning? Sure. You know what it is? No. Ok, leave my house at 7:30am. Sweet. And so it began. Dropped one car in Big Pine, and drove up to the trailhead. We were on trail around 9am. The first mile or two was STELLAR. Gradual climb out of the valley, on sandy doubletrack – perfect for the fat bikes – it just ate it up the soft conditions so much better than a mountain bike would. 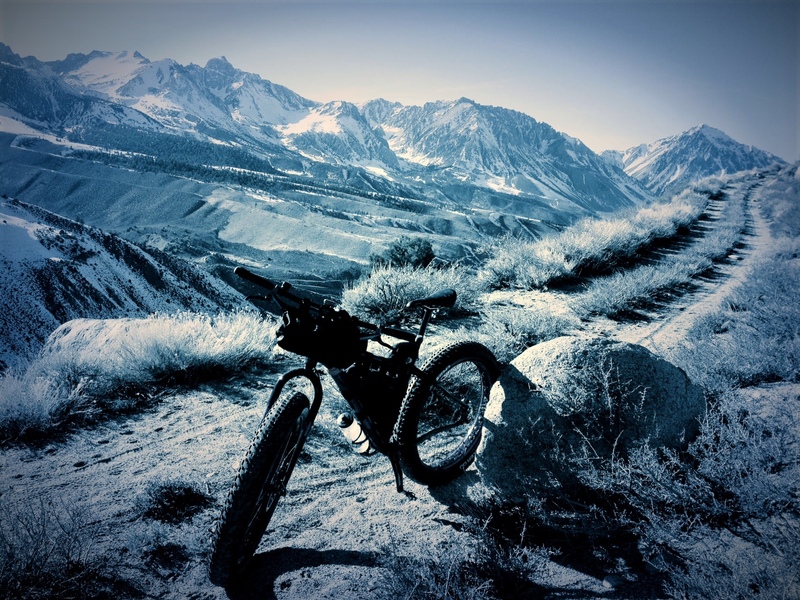 I was geared 32:21 on my Mukluk, and had a fairly loaded bike. The custom Porcelain Rocket frame bag from my Niner fit nearly perfectly on the fat bike – stoked! I was ready for the worst, just in case we had to bivvy, needed extra layers, food, etc – It’s a very remote ride, at elevation, so didn’t wanna get caught with pants down. Even with the heavy bike, the 21t was a great choice, I was able to do most of the climbing in the saddle. As we reached 9k-9.5k’ we started to see more snow on the shady aspects… but even that was fairly rideable, and the south/west facing aspects were still dry. Then, as we got to 10k it started to get a bit messy. Deeper snow. Uh oh. No snowmobiles are allowed up here, so no friends to pack the trails. Uh oh. We were ready for hike a bike. No problem. That’s what I was saying for the first couple hours I was breaking trail and post-holing to hip deep snow. We were relentless with our hiking. Having a blast. 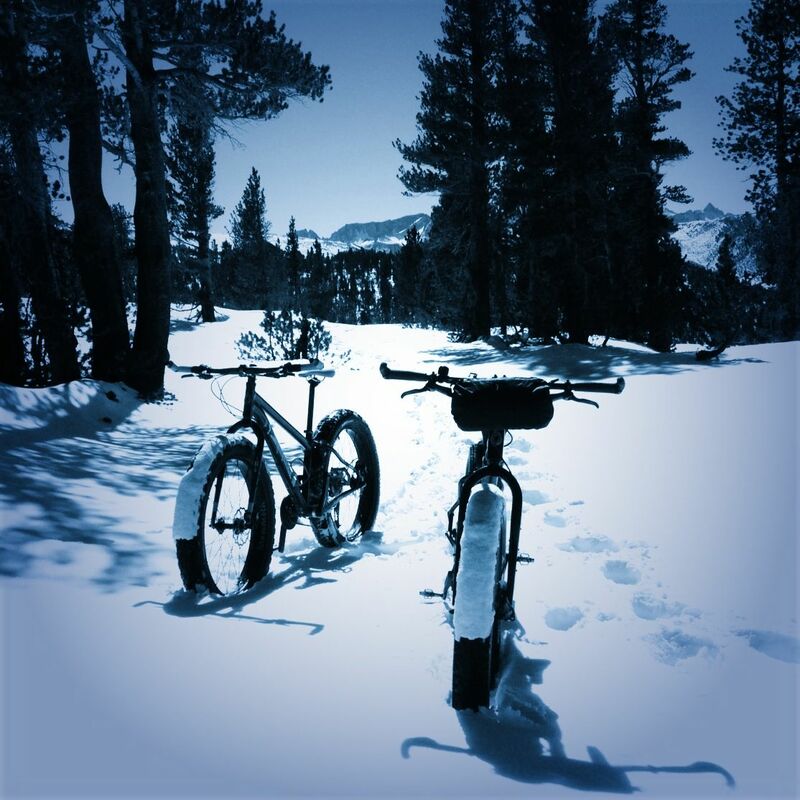 Just being out in nature, isolated, pushing fat bikes through snow. The mantra. Life is good. All smiles. Although not what we were hoping for, it was fun anyway. Before we knew it, we were at a crossroads. We’d been gone for over 5 hours, and were at about 10,800′ – only a couple hundred feet more to climb before reaching the summit, and then it’s downhill into the flats. Unfortunately, we had only gone a little more than 5 miles in 5 + hours… we had 20 more miles to go, and no way to see what we were in for. If we descended into the flats, we’d be in no man’s land, almost surely having to pull an all-nighter. We were already spent from the hours of post-holing and dragging our bikes, and running low on hydration and nutrition reserves. Our feet were soaked and starting to get cold. Although I was prepared for an emergency bivvy, it wouldn’t have been comfy or FUN – and lacking this most critical “fun factor”, it made our decision easy. We chalked it up for experience, and enjoyed the amazing views and descents as we backtracked to our car in Bishop Creek Lodge. 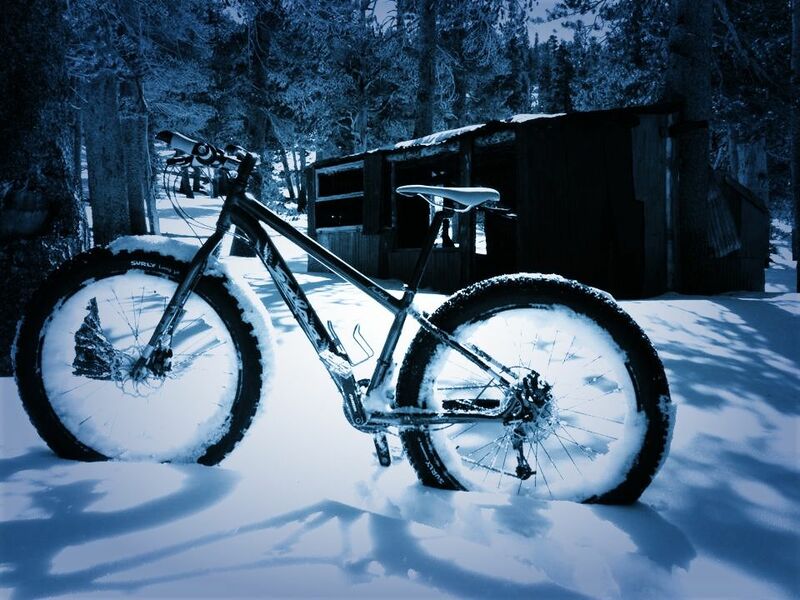 Descending on a fat bike is like nothing else. We were able to float over much of the snow we hiked uphill. Slipping and sliding, teetering on the the edge of control – what a blast!!! Giddy the whole way. It was a successful journey, because we arrived at the car safely, unscathed. In the end, we mostly “hiked” 2,700′ vert and 11 miles, getting up to 10,900′. Sounds anticlimactic, but it was far from that. A great meal at Raymond’s Deli to cap it off, and the memories to hold. Descending back down to Bishop Creek Lodge. Pretend one of the doubletracks doesn’t exist, and voila, primo singletrack!! But I tell you this. 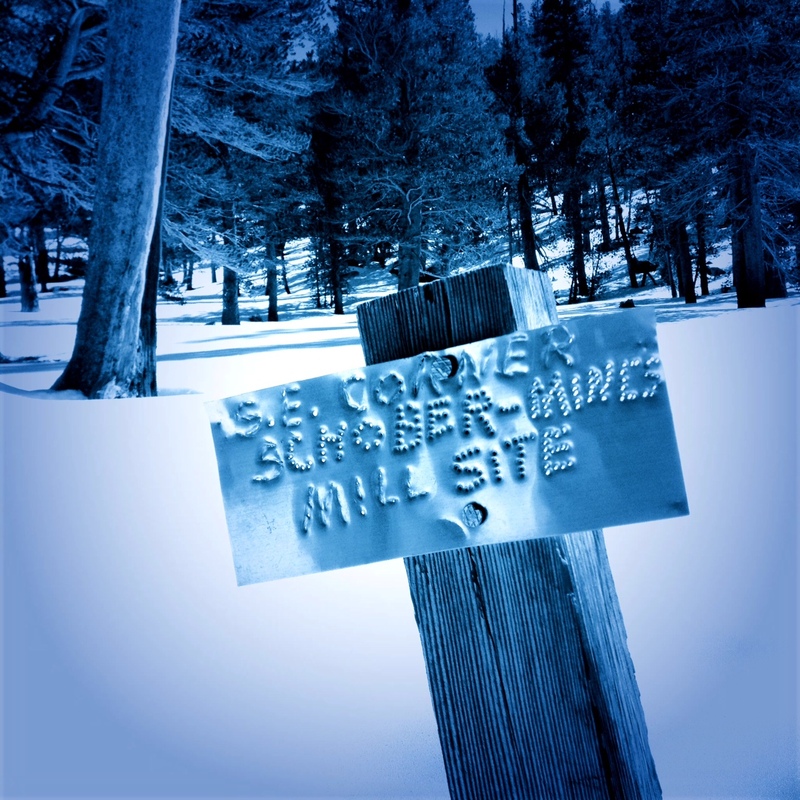 We are not done with the infamous Coyote High Sierra Traverse. Plans are made for September. Howl at the moon. 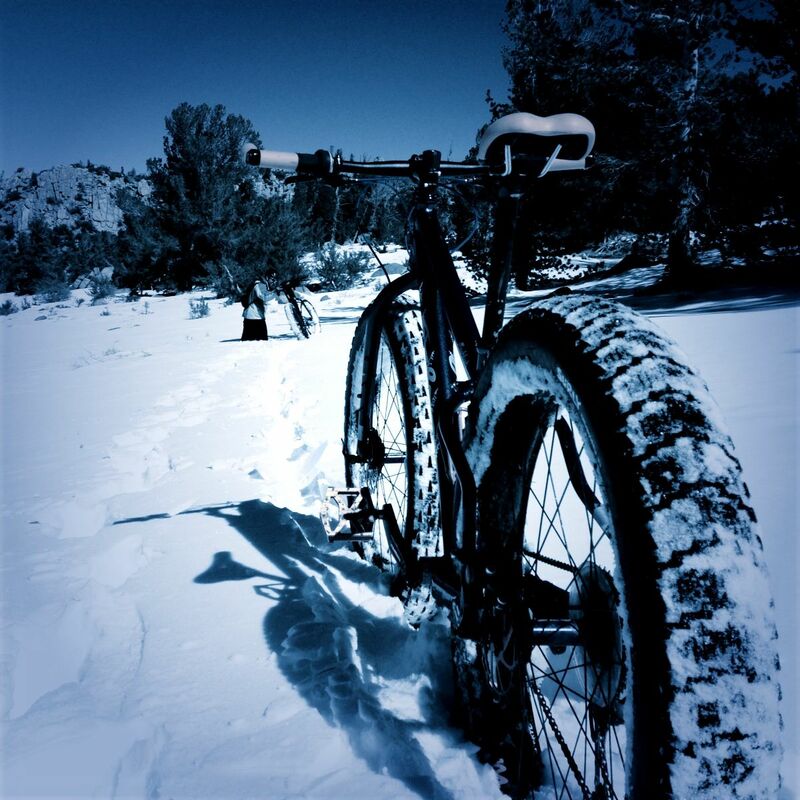 This entry was posted in Favorite Rides, Snow & Fat Biking and tagged big pine, bishop, coyote flats, coyote traverse, fat bike, glacier lodge, husker du, mountain bike, porcelain rocket, pugsley, salsa mukluk, snow bike, south lake. Bookmark the permalink.